The general philosophy and theory behind my approach to what I call therapeutic coaching and education can be summarized as holistic-integral. I utilize when appropriate an arts-based therapeutic method. My speciality is helping you and your organization (relations) to analyze emotionality via motivations (see 4 Principles of Meta-motivation document below). I've recently focused my 30+ years of counseling practice into a notion of "coupleship" at the base of all motivation to do coaching and/or therapeutic interventions because of the nature of the human condition as one of degrees of relationality--that is, we are relational beings. I thus start with what we all seem to desire and to have conflict with, and that is an intimate coupleship with someone, which may be sexual or not, which may be of opposite genders or not, and which may be a committed relationship or not. We cannot live in the world healthily without one or more coupleships (e.g., friends, allies, marriages, maternal and paternal, mentors, siblings, colleagues, etc.). My experience shows me, as do the statics, that relationships are difficult to maintain often and may cause great challenge, suffering, and sometimes abuse and violence--while, they also can undoubtedly be one of our most meaningful sources of self-worth, if not growth, renewal and zestfulness. What about "love?" That get's more complex. The business name I chose is all about Love and Fear (see homepage). For research articles and online courses on these topics and others see http://csiie.org (Dept. of Integral & 'Fear' Studies). Underpinning my coaching practice in general is that I will work with Love and Fear as a "couple" within you, within your coupleships, and organizations (e.g., family, business, human services) as foundational to working through conflict between Love and Fear as a pattern of motivation, perceptual lens, and design for relationships of all kinds. The effort will be to bring a new L-F balance to your most troubling problems in which I'll help you find the best solutions, in the shortest time. My work can be deep, healing,and transformative (more long-term), and/or brief and strategic (more short-term) based on your circumstances, desires, and ability to pay for my services. I'll institute art/aesthetic and creativity modalities to stir the imagination, to get outside the box, etc. so that new and effective loving ways of living your coupleship(s) can be enacted. One of the primary practices I teach is Fearanalysis (download guidebook below). Also visit online course in this practice entitled "How to Free Yourself From the 'Fear' Matrix"
I have recently published major articles in: International Journal of Addictions & Mental Health, and in the past in Journal of Humanistic Psychology. (see Publications). I am available to do introductory presentations (20 min. to 2 hrs), seminars, workshops, training courses, retreats and long-term contracts. I do face-to-face as well as online (skype) and/or phone call coaching. Your confidentiality in all cases is protected as per the requirements of any professional coach or counselor. Where appropriate I will access other coaches, counselors or consultants. I'll make referrals as needed. I am not your average or conventional practitioner and thus, creative, spontaneous, and innovative approaches are going to be core to my work. Expect to be challenged and supported compassionately. I believe in everyone's potential to heal and change, more or less radically, depending on conditions and developmental factors at particular stages of life. Free Exploratory Consult - I am available for free introductory interviews up to 30 min. to see if we are compatible before making a commitment to one or more sessions. Fees: I am an independent coach, not with normal training and licenses, thus, you'll get no insurance benefit coverage, or legally-based consultations that would stand up in court, from hiring me. In general, my philosophy is to charge what people and organizations can afford, thus fees vary with clients' capacities to pay. Generally (on average), I charge $80 per 1.5 hr session (US dollars, non-corporate rate). Contact me for discussion about specifics and alternative payments. In some instances I'll do sessions for barter. Here's hoping you continue to march on with your wisdom and intellectual samurai character, every one who claims to be integral needs to read your work. You've opened my mind, soul and heart to a whole new world. Thanks for being true to who you are, and sharing that fabulous person with the rest of us. 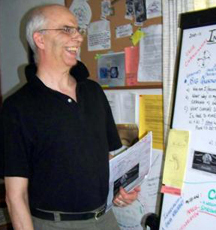 NEWSLETTER FOR INTEGRAL COACHES AND COUNSELORS - from time to time I'll be putting together a newsletter for counselors studying integral theory and its applications to their practice. I've attached a copy of both a humorous one-act play I wrote on foundations of integral counseling and my first issue of the newsletter. Enjoy.